Though often overlooked, the density of actual parcels (a tract of land or real property owned by individuals, a group of people, organizations, the government, etc.) provides an excellent view of development across a region, state, or beyond. Parcel density does not take into account how individual parcels are used, but provides guidance as to where development has or is likely occurring. A primary advantage to parcel density over other land use metrics is that parcel density analyzes what is actually on the ground, versus modeling land use from satellite and other remote sensing techniques, which can cause vast underestimations in land use densities due to the cover of tree canopies. With closer estimations, trends in land use can be identified. For example, once a parcel has been subdivided, it is more likely to become developed. As parcels are subdivided into smaller and smaller tracts, these areas place a greater stress on the natural environment. 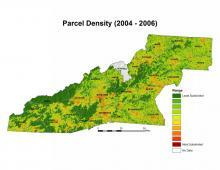 It is noticed that parcel density across Western North Carolina is typically highest around city and town centers – such as in Buncombe County, which contains the highest parcel density – but can also remain high along frequently-used travel corridors. Isolated pockets of high density, such as in Wolf Laurel or Beech Mountain, also exist. Further analysis of parcel density will also reveal changes in the sizes of parcels, such as in Buncombe County, where the number of parcels greater than 10 acres is very low and continues to decrease. Parcel density analysis: Resource Data, Inc., U.S. Fish and Wildlife Service, and Warren Wilson College.